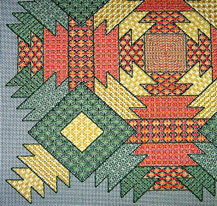 This dramatic geometric was inspired by the classic quilt pattern that is based on the pineapple shape. Three different pastel "sorbet" shades were chosen to interpret the four-way arrangement, and each color forms a distinct shape within the overall design. The green areas punctuate the circular area that is inherent within the design. The yellow areas create a distinctive cross that "pops" visually due to the high sheen and warmth of the bright yellow threads. The pink areas define the upright "pineapples" and form a softer background for the two other areas. 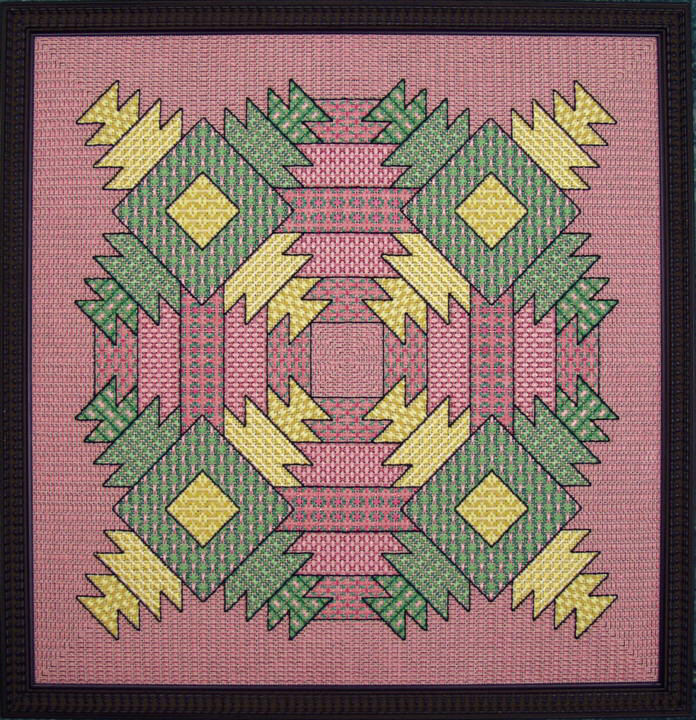 The background and center areas have the same pink/fuchsia laidwork pattern. The basic shapes are rectangular in this design but the striking indentations of the pineapple contours make the areas more exciting. Each shape is fully charted and set up with backstitched outlines first. 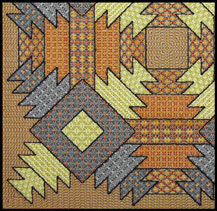 Then the patterns can be centered properly within each shape.